Download an almost perfect stage 1 pattern here courtesy of J.D.Lowe. It's an .avi compressed into a 817k .rar file as it is half the size of the same archive in .zip format, and unpacks to 72MB! This was recorded with frameskip on to reduce the .avi filesize as well! 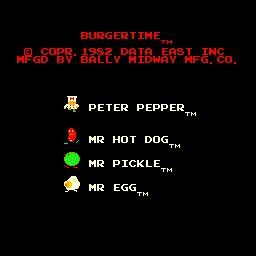 Burgertime is a popular older platform game where the objective is to guide Peter Pepper around the screen collecting the ingredients for burgers (2 buns, salad and a burger) and stacking at them bottom of the screen. You do this by running over an ingredient, and it then drops to the level below. Any ingredient on the level below that then drops down one level, and so on. 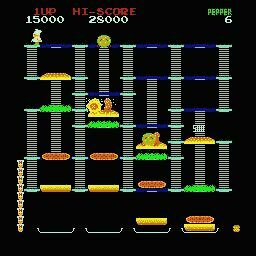 Completion of a screen is achieved when all the completed burgers are stacked at the bottom of the screen. All the while you are running around the screen, you are being pursued by a hot dog, a pickle and an egg, which must be avoided, held or killed. They can be killed if they are under a burger ingredient when it drops, temporarily removing them from the screen. You also have a pepper spray which can be used a limited number of times to freeze any enemies in its path. If you manage to drop the bun from the top level when one of your enemies is chasing you across it, it will fall the whole height of the screen stacking all the ingredients at the bottom awarding you extra points. Scoring: Stacking a burger ingredient: 50 points. Collecting Ice Cream: 500 points. Dropping an enemy: 500 points each. Burger ingredients don't drop until they are completely walked over. You can wait on the last part until enemies are below and then complete the crossing to drop it on them. 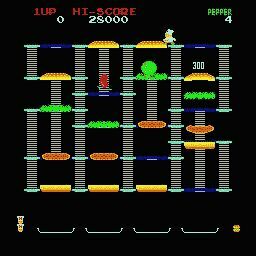 Use the pepper to freeze as many enemies as possible below a burger and then run up the ladder and drop it on them. Patience - you're gonna need it. These bad guys will chase after you time and time again, but don't give up. When you mess with them just the right way, they will succumb. Your adversaries are not known for their intelligence. For example, when you and an egg are on the exact same level and you step down a ladder only two steps, the egg will go down a different ladder if there is one in front of him. This will happen almost every time, and it's important to know this for survival. Also, most of the time they will go for the ladder that is right in front of them if they "think" it will get them to you faster. As a general rule, only use the peppers in emergencies or to group the baddies together. Sometimes you will need to use one when they appear to be together but one is actually pulling ahead a little. If you time it right, you can group them again, but these tips will come later. Your major points come from getting all of the bad guys on the screen onto one of the hamburger ingredients and slamming that ingredient down to the bottom. In the first two screens, if you do this correctly, you can rack up 4000 points for each ingredient. After that, you can rack up 16,000 points easily - and chances are, you'll get yourself an extra life! Study as many of the experts' INPs from MARP as possible. This can not be stressed enough. You can see different moves for different levels, and you never know what could help you out best.